Moving to Russia - Compare International Movers & Save up to 70% ! Find and compare a number of international moves for your move to Russia. It is quick, easy and completely cost free to use the services of Intlmovers. You don’t have to waste time chasing around because the international moving companies will contact you back directly with their offers, allowing you to spend your time with other important tasks. Making an international move to Russia is a big deal. You’ve got lots of things to arrange and you want to feel confident that your move is being handled professionally and reliably. With Intlmovers, you are automatically presented with a list of professional international moving companies who specifically manage moves from your chosen location. Just use the easy to use drop down menu below to begin your request! You can compare quotes from up to six international movers in a single request with Intlmovers. The movers receive your request as soon as you make your online submission and they will arrange a customized quote for your move to Russia. They will often wish to contact you for further information or to clarify your requirements a little more, so it is important to be available via either email or telephone to arrange the final quote. Complete the easy request form and receive quotes directly for international moves to Russia. The international moving companies have years of experience with moves to Russia. No matter where you are moving from, an international move to Russia is likely to open up an entirely new world to you. Russia is the largest country in the world and is shrouded in a rich and colorful history. Making a move to this incredible land is likely to be an eye opening experience for many expats and it is handy to have a little background info about the country. Russia, the former Soviet Union (USSR – Union of Soviet Socialist Republics) is the largest country in the world covering a total area of over 22 million square kilometers. It has a population of nearly 300 million people. The capital and largest city in Russia is Moscow with a population of around 12 million people. The currency in Russia is the ruble, which is made up of 100 kopeks. While the incomes and cost of living for many Russians may be considered very reasonable, for expats it is likely to be another story. Most expats moving to Russia end up in either Moscow or St Petersburg, and the cost of living is considered very high. In fact, in the 2011 cost of living survey, Moscow was ranked number four out of a total of over 200 cities worldwide. Living outside of the urban centers of Russia usually offers a lower cost of living. When you are visiting Russia, all foreigners will need a visa. If you are a citizen of the former Soviet Republics, only those from Georgia and Turkmenistan are required to have a visa to enter Russia. The visa requirements are strict and you will need to have an invitation from either a Russian citizen or company where the actual visa is issued. Before entering Russia, you will be issued with a migrant card. It is important that this card is completed correctly and is kept with your passport and visa as it will be checked at the border control. Your visa needs to be registered within three days of arriving in the country. This can be done with the help of the person or the company that issued your invitation. Your visa is then registered at the Department of Visas and Registration (UVIR). The cost associated with Russian visas varies, as does the amount of time that it takes to process your visa request. The actual amount will be dependent upon your citizenship and the embassy or consulate that you apply through. Whilst there are many different types of visas, the main options include tourist visa, business visa, private visa, transit visa and family visa. Experienced international movers promote their services on Intlmovers. They have many years of trusted professional service in the logistics and shipping arena. 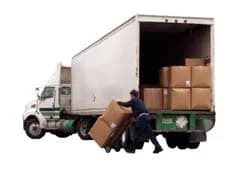 You can feel confident that you are entrusting your goods with reputable companies who will carefully and efficiently manage your international move. You can receive up to six moving quotes for your international move to Russia. You can then much more easily compare and contrast the offers you receive and make an informed decision about your chosen international moving company. If you are not happy with the responses that you receive, you are under absolutely no obligation to accept any of the quotes that you receive via the Intlmovers quote comparison service. That way, you can request quotes safe in the knowledge that they are not only cost free but also completely obligation free!